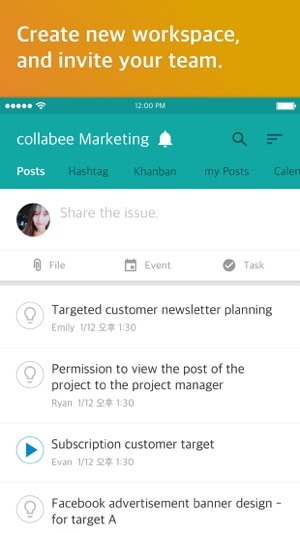 Teams accomplish more with collabee because their full workflow is organized by each work issue. Collaborating with your team in a messenger may be fun and easy, but scattered conversations discussing multiple work issues simultaneously leads to workflow disaster. 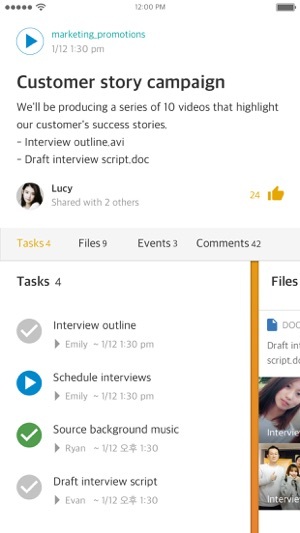 Collabee naturally organizes the full workflow for each of the work issues that your team addresses from start to finish, in one easy-to-manage screen. - Workspaces can be used to address your team's various needs. 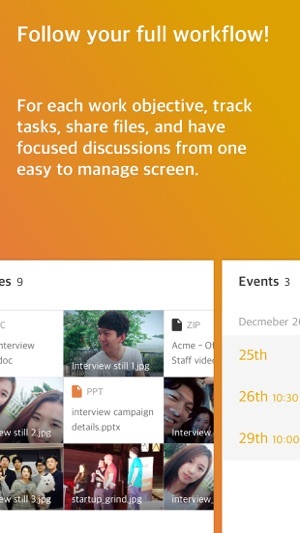 - They can be used to share and archive company/team wide announcements, manage recurring processes, or track important projects. 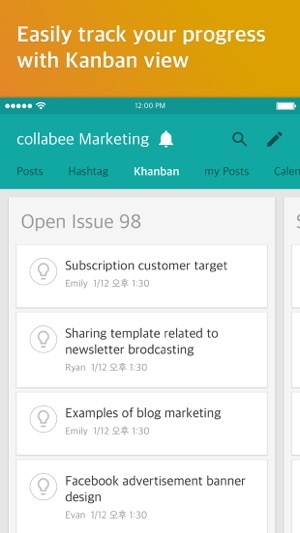 - Invite your team members to each workspace to get started. The full workflow for each work issue stays together from start to finish. - Great results can start by sharing the simplest of ideas. - Grow each idea by discussing them via comments. 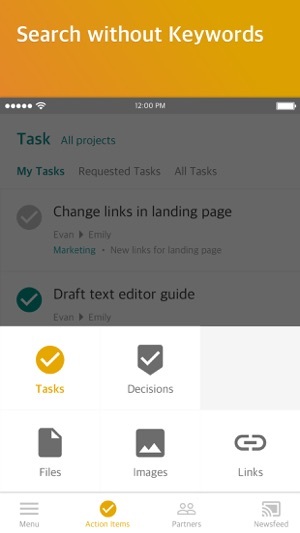 - Distribute tasks and track them with your team to ensure work gets done. - Share your results and give each other feedback. 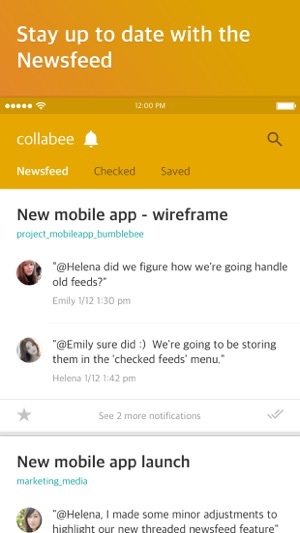 - Everything in collabee is connected together by each work issue. Meaning you can search through multiple channels depending on how you like to remember things. Whether it's a file, task, decision, event, or even link. - You can instantly check the full historical context of all content with one click because everything connects back to the related work issue. - Control notificaitons at both the project workspace and individual work issue level. - Focus on your work, and don't worry about missing important updates, because all of your notifications will be nicely threaded by each work issue when you check back. - When you're no longer actively involved in a project or work issue. Simply turn off the notifications and go back to focusing on getting your work done! - 'Create new project': resolved duplicate issues. 현재 본사에서는 마이크로소프트 팀스, 플래너 쓰고 있습니다. 이번에 신규 사업에 사용을 목적으로 이런저런 협업툴을 찾아보고 비교 해 본 결과 콜라비가 가장 적합할 듯 하여서 도입을 해 보려고 합니다..만.? 아이패드 가로모드가 지원이 되질 않네요.. 그렇기 때문에 키보드도 사용을 할 수가 없습니다. 가로모드 지원이 되면 참 유용하게 사용 할 수 있을 것 같습니다. 콜라비를 사용하다보니 현저히 메신저 사용량이 줄어 들었습니다. 업무 단위 별로 콜라비에 등록해서 협업하다보니 쓸데없이 대화하는 것보다 일이 진행이 되더라고요.대화보다 일에 집중하게 되달까나.